Her sweet note (almost) makes me wish I had a job so I could come home to notes like this. P.S. Our little household is usually very crabby by the time Ed comes home, so there are days when Ed wishes he could turn around and go back out the door! Aw! What a sweet note! I could totally go for a note like this from my oldest right about now. We are butting heads a lot lately. That is so sweet!! I often joke, that I too need to get away so that I get a chance to "miss" my girls! Both Dad AND Daddy, and then both Like and LOVE.Did she ask him for something once he got home? Seeing as how you usually come in through the garage door, you shouldn't feel bad, Ed! That's so sweet! It's nice to remind dads out there that they are appreciated! My kids are often so excited to see him that they rush to the door. I wish I had that experience more often, but like you, I don't necessarily want to have to go to a job to get it. What a precious note! It's one to keep for sure. 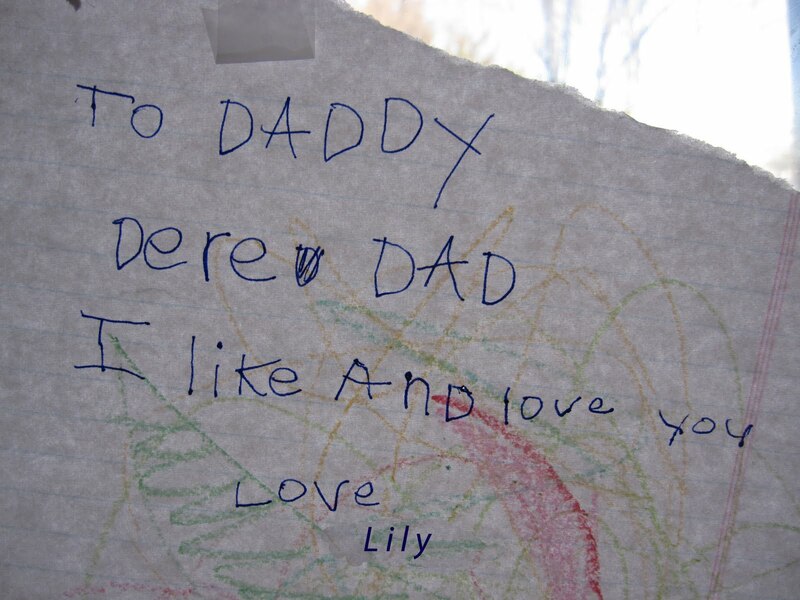 I think it's interesting too, how Lily made a distinction between like and love. They really aren't the same thing. She clearly likes AND loves her daddy! That is so sweet! I bet he didn't mind coming in that day!